President Barack Obama and his family are welcoming their dog next week, TMZ.com reports. 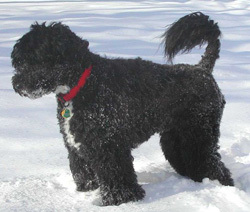 The six-month-old Portuguese water dog comes from a kennel in Texas. His name is Charlie, but the Obamas will reportedly rename it. Senator Ted Kennedy, who bought his own dogs from the same kennel, will reportedly present the president with the dog on Tuesday. Alright!! A lapdog for the lapdog of the bourgeoisie! Obama is a neo-con in (not-very-convincing) disguise. This is the same guy who thinks Iraqis should pay for the rebuilding of their country (now awash in carcinogenic depleted uranium dust from American D.U. munitions) that was trashed by the U.S., competed with Hillary in the primaries to see who could be more belligerant a warhawk regarding the Afghanistan-Pakistan situation, spouts the official myth of 9/11, sent George Shultz and HENRY KISSINGER to meet with the Russians, wears a flag lapel pin like a fascist with no taste, gave a right-wing speech to the right-wing Veterans of Foreign Wars, had dinner with George Will, William Krystol and Charles Krauthammer, praises Ronald Reagan, professes his love for A.I.P.A.C., went to the Bilderberg Group meeting, gave speeches to the Council on Foreign Relations, stuffs his administration with Council on Foreign Relations-Trilateral Commission-Bilderberg Group-A.I.P.A.C.-Republicans-“New” [fake, basically Republican] Democrats, appoints as his White House chief of Staff a Zionist who as D.N.C. chairman made sure the funding in the 2006 midterms was funneled only to pro-war “Democrats”, shelves the windfall tax on Big Oil companies, says the rich should be looked up to as role models, threw Reverand Wright under the bus, spouts the same conservative rhetoric about black people just needing to pull themselves up by their bootstraps, voted for F.I.S.A., voted for immunity for wiretapping telecom companies, voted for continuation of the Patriot Act (after saying he wouldn’t), has right-wing bigot Rick Warren give the invocation, is against gay marriage, is against legalizing drugs (meaning he’s in favor of the government telling adults what they can and cannot ingest in the privacy of their own homes), is for the death penalty, is escalating the war in Afghanistan, wants to expand the “Peace Corps” C.I.A. front organization, worked for a C.I.A. front company right after he graduated Harvard, is continuing the Cheney regime’s “state secrets” crutch, is continuing to use “signing statements” (something he railed against in the campaign), provides loopholes so the C.I.A. can still torture, explicitly says the C.I.A. can still kidnap whomever it wants and has made it plain he will let Bush, Cheney, Rumsfeld and the other war criminals get away with their torture and mass murder. These are just SOME examples. To the Obamabots out there, you may as well have voted for McCain. They’re both controlled puppets of the elite. That’s the way American politics is. Nobody that ACTUALLY would change things is going to be allowed to rise to national prominence. All the ones that the corporate-owned media incessantly told us had any chance at getting either of the nominations, Obama, Hillary, Edwards, Richardson, McCain, Giuliani, Romney etc. are all just bought-and-paid-for marionettes. That way, no matter WHO the voters choose it will be somebody already in the pocket of the elite ultra-rich ruling class bloodsuckers in the C.F.R., Trilateral Commission and Bilderberg Group. America is a sham democracy.